I come from Wednesbury, always lived over Hill Top way. I was diagnosed two years ago in November, I found out I’d got multiple Myeloma and I was asked if I wanted to go over to the QE to see a Specialist there for a Stem Cell. Me and my eldest son went, he explained everything , what the treatment wad about, what I was going to go through. My son looked at me and said ‘you’ve got to go through with it Mum’. We were both very emotional, I was scared, really scared. I was taken in on 1st June, I’d lost quite a bit of weight through worry and upset and it took me until now almost 12 months to get over the Stem Cell but I’m getting there. I’ve got two sons, two very caring sons. My youngest son is staying with me at the moment. He asked if I’d like to go away for a few days and he booked up a holiday. He asked me where I’d like to go and I said Ilfracombe because I spent childhood holidays with my Mum and Dad down there. So we went down to Barnstaple and one sunny day we went round Ilfracombe and he said ‘come on, let’s see if we can find the caravan site where you used to stay’. Well, all I could remember was that it was Watermouth Caves. Going through the lanes in the car it all came back to me. I remembered – it was like déjà vu. I went down to the Bay, down some steps into the bay and it took me back because there was this little cove that I remember from when I was little and my son took a photo for me to keep. 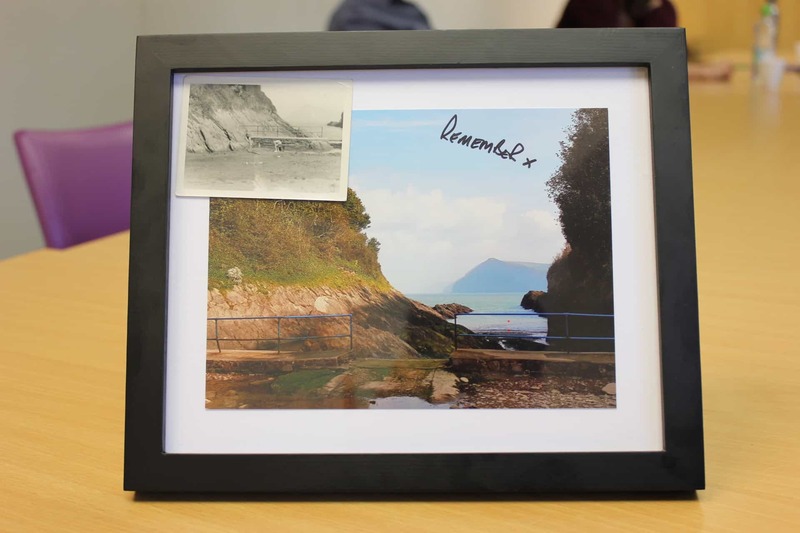 Christmas morning, one of my presents was a photo of the Bay and little did I know that my son had found a little photo out of me when I was about eight, playing in the same cove and he put it in a frame for me and he’s put ‘REMEMBER X’ which I still feel touchy about now. He says ‘there’s a box underneath my bed Mom. I’ve looked through them and I remembered seeing this photo.’ It was so nice for him to do and it’s on the wall in my bedroom, I wake up to it every morning. It takes me back, I can remember the holidays. I remember the caravan we stayed in. There was a donkey on the site. There was a duck and we nicknamed him Charlie Drake. I thought what a lovely present it was. It is nice to remember. Sentimental I am!